Background: Based in Miami, Dexter Morgan is a blood-spatter expert who is instrumental in solving murders for the Miami-Dade police department. 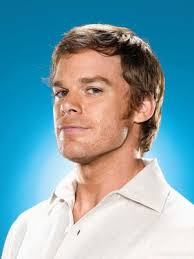 What nobody knows about Dexter is that not only does he solve the murders, but he also kills the murderers. His father noticed at a young age that Dexter would probably grow up to be serial killer, and he taught his son how to use his urges for good of humanity.